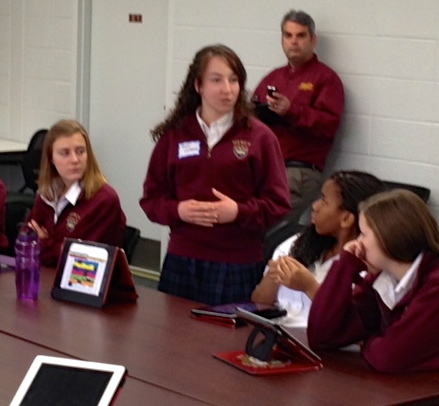 Lucy has a great idea for helping our ninth graders become acquainted– She asked each one to name her iPad “superpower” and favorite app. There was an unanticipated benefit to this conversation. 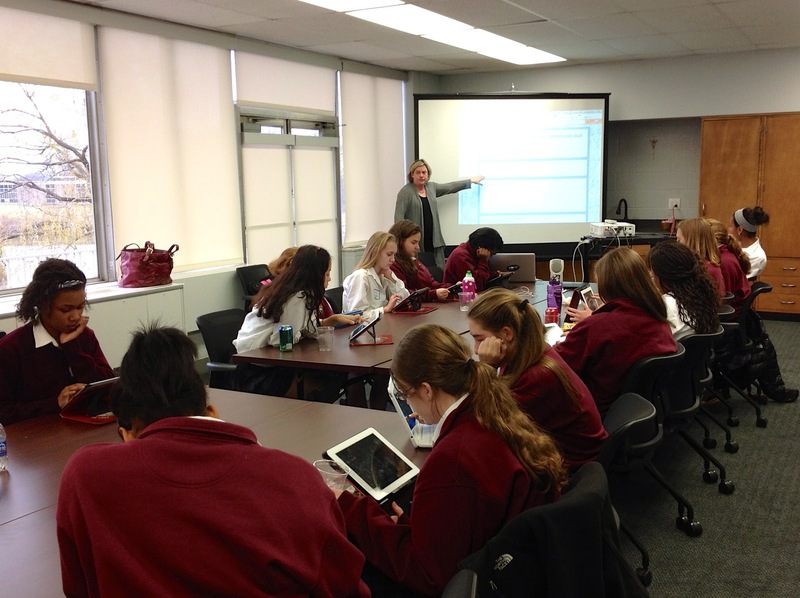 The girls served as a window into the classroom usage of the iPad and to what degree it had been integrated into their teachers’ instructional methods. Their nominated apps were interesting, and I will share them in an upcoming post. In anticipation of the day, Lucy, Tom James, and I developed an agenda that we shared with the girls in the form of a Google Doc. 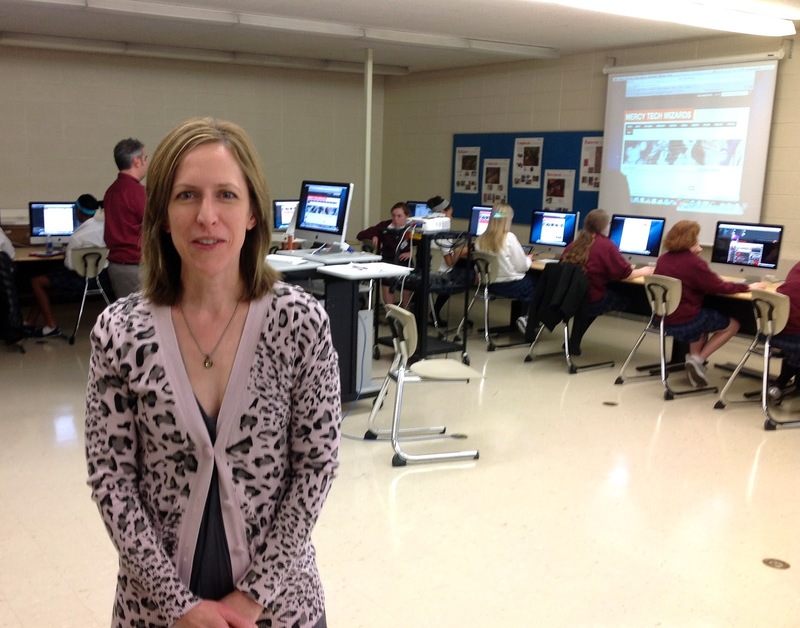 Included in the agenda were links to sites which featured student technology groups which were active elsewhere. Consequently, after the ice-breaker, the girls did some online research and brainstormed about the mission and activities of our particular group. Kern Kelley streamed live to us. Before and during lunch our ninth graders visited Utah, Maine, and Chicago by teleconferencing with Steve Hargadon, Kern Kelley, Jason Markey. These three esteemed educators shared their ideas about the formation of student tech groups such as ours. 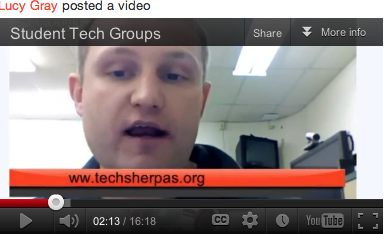 Kern’s description of the Tech Sherpas was particularly helpful. The group spent considerable time discussing the platform for future online collaboration. Drawing on Lucy’s rich experience in social media we decided on a Ning. Throughout the day I took advantage of my relatively passive role to take pictures and record video about the wizards and other Mercy 2.0 matters. Without a doubt, November 30, 2012, was one of my favorite all-time days at Mercy. One of my all time favorite days, too! Thanks for the opportunity to work with your amazing students! Great vibe throughout the day. iPad Wizards Rock! I’d love for the the group to have conversations about research and Mercy: what resources do they use, what’s available to them as Mercy students, incoming evaluation of info skills(?) , identifying sources of help if needed, etc. Would they suggest containers for tutorials, podcasts, videos…..and what would induce students to look at them and use them if needed? Is one method preferred over another (in this group anyway)? Solutions are not necessarily expected, but conversation, suggestions, and implementation help would be appreciated!